While my wife and I were in New Orleans, we stopped by a Walgreens near Jackson Square to pick up some snacks. While we were standing in line to check out, I heard this couple behind me talking, then my ears perked up when the gentleman said, “That’s the D&D dragon symbol. Oh, and a Bag of Holding. I know what that is.” I turned around and smiled. Instantly a conversation started. He and his wife were from Florida, vacationing in New Orleans. He had noticed my backpack was covered in patches and was looking at them while waiting. 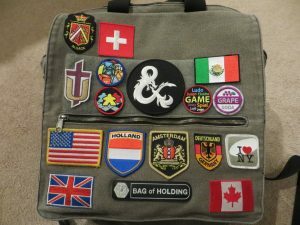 As I mentioned in an earlier post, I carry a first generation ThinkGeek Bag of Holding, which since I originally posted about it have now covered it in patches of places I have been and things that interest me. When I am pushing my wife in her wheelchair, I have it converted to a backpack. So, the patches are just below eye level for people behind me. While perusing my patches and quietly discussing them with his wife, he noticed the D&D dragon symbol and, as a fellow gamer, he became more excited and his voice raised which is why I heard him. Thus, my D&D patch started up a conversation with a total stranger. Yet, we didn’t stay strangers long as we both had the common interest of gaming to talk about. While we waited in line, we talked about the other gaming patches on my bag, our favorite RPGs, and the sights we had seen in New Orleans so far. They were fun to talk while waiting in line, then we all checked out and headed our own ways in the city. I remember meeting Mike Mearls at Gen Con 2015 and acquiring the D&D dragon patch along with the Dungeon Master patch. I switch between them at various times on my bag (part of the bag has a velcro area so I can swap patches around for various trips and conventions). I had no idea then that the patches would lead to conversation with gamers later on. My plain Bag of Holding would get attention sometimes for those who knew what it was. Since I have added the country flags and gaming patches, it definitely has become more of a conversation starter. So now, when I travel I seek out new patches for it. I just picked up a new streetcar patch in New Orleans that I will be adding to the bag soon as well. Do you decorate your bag or jacket with patches/pins/badges? Have you had a random encounter with a fellow gamer while traveling? What started the conversation? Was it something you were wearing or carrying?